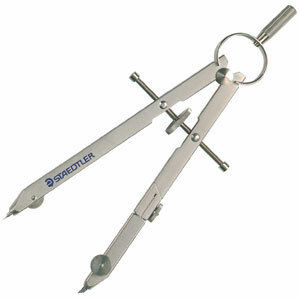 This solid metal compass from Staedtler Mars features a spindle guide, spring-bow head, and center wheel. Great for precise drawing of circles and arcs, the Mars 551 Comfort Compass also has a hinged leg joint and needle shoe. The compass measures approximately 6" (15 cm) long and draws circles up to approximately 10½" (27 cm) in diameter.